In addition to normal A/P activity, most companies have several payables, which are due on a regular basis and for which there is no invoice and often not even a statement or any kind of reminder of when payment is due. Such things include rent, loan payments, mortgage payments, lease payments and notes payable. 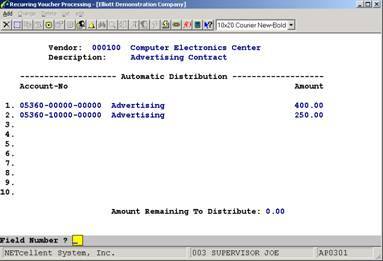 These payables can be handled in the Accounts Payable package, using recurring vouchers. Recurring vouchers can recur in two different ways. Either they are due on a specific day of the month (possibly every two or every three months) or they are due every so many days (possibly every 14 days or every 30 days). These two types of recurrence are type M for monthly and type N for number of days. Each recurring voucher has a starting date and an ending date. The starting date is the date the first payment is due. The ending date is the date of the last payment. On some loans, there will be a certain number of payments at one rate and then more payments at another rate. Two recurring vouchers could be set up with consecutive date ranges to handle the change in payment amount automatically. Once the Recurring Voucher File is set up, all that remains to be done is to post the recurring vouchers to the A/P Transaction File on a regular basis. These transactions are, in turn, posted to the A/P Open Item File, the same as the transactions entered through A/P Transaction Processing. The vouchers can then be selected for payment and computer checks will be printed to pay them. Even if recurring vouchers are not posted to the A/P Transaction File frequently enough, payments will not be skipped by the application. The recurring Post Recurring Transactions posting application will create auto­matically as many A/P transactions as needed to bring the payments up to date. Enter the vendor number of the vendor to whom payment will be due. The vendor's name will be displayed automatically. If you do not know the vendor number of the vendor you want, press the F7 key and a search for the vendor by number can be done or press the F8 key and a search by vendor name can be done. 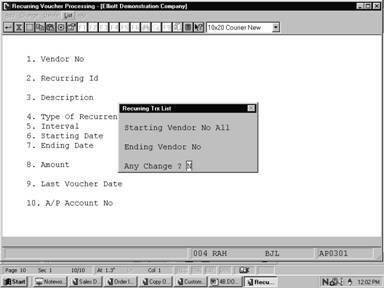 This field defines the recurring vouchers for a vendor. 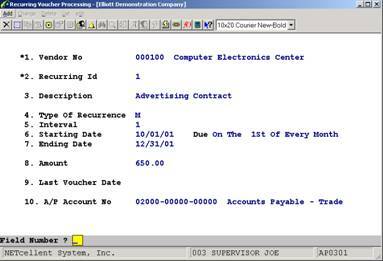 It is used to define one of several recurring vouchers for a vendor. The default recurring ID is 1, so if you only have one recurring voucher for a vendor, use this default. Pressing the F1 key will bring up the next recurring voucher for this vendor, in change and delete mode. Enter a description of the recurring voucher. For example, a recurring voucher might have a description Rent ‑ 2441 Honolulu Building. If payment will always be due on a certain day of the month, even if there will be more than one month between payments, enter M.
If the payments are due every specified number of days (such as once every 30 days), then enter N.
There is no default for this field. Once entered this field may not be changed. If M was entered above, enter the number of months between each payment. If payment is due every month, enter 1. If payment is due every other month, enter 2. If N was entered above, enter the number of days between payments. If payment is due every week, enter 7. If payment is due every other week, enter 14. There is no default for this field. Enter a date in the standard date format. Enter the date that the first payment is to be made. If this is a type M recurring voucher, payments will always be due on the same day of the month as this date. When this field has been entered, a description of when the payment is due will be displayed on the screen. Take a look at this description to ensure that the data entered is correct. If this date is changed, the last voucher date will be set to zero. If field #4 Type Of Recurrence is defined as M (Monthly) and the Interval in field #5, is set at 1 (month), the system displays a starting date and automatically calculates the due date for every subsequent month thereafter. If field #4 Type Of Recurrence is defined as N (Number Of Days Between Payments), and the Interval in field #5 is set at 1 (day), the system displays the starting date, and automatically calculates the due date for every day thereafter. Enter the date that the last pay­ment is to be made or the date after which no payments should be made. This date need not fall exactly on a payment date. 9 numeric digits with 2 decimal places and an optional minus sign (9,999,999.99). This field will be used by the package to keep track of the last voucher that was posted from this recurring voucher. This field should be left blank when a new recurring voucher is entered in add mode. If, for some reason, you wish to have the recurring voucher posting program skip a voucher or two, this can be done by setting this date to the date of the last voucher which should be skipped. This would cause the system to think that vouchers had already been created up to this date, so it would skip them. If this date is changed, the starting date will be updated to a date one interval following this date. 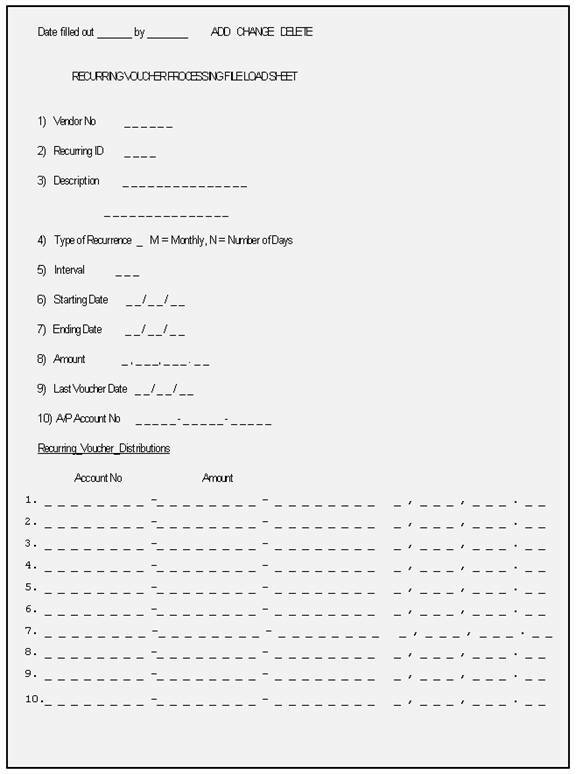 An account number in the standard account number format. Enter the A/P account (or any other liability account), which will be affected by the trans­action. Pressing the F7 key will allow you to search for the account by number or pressing the F8 key will allow you to search for the account by name. Defaults to the default Accounts Payable account number. 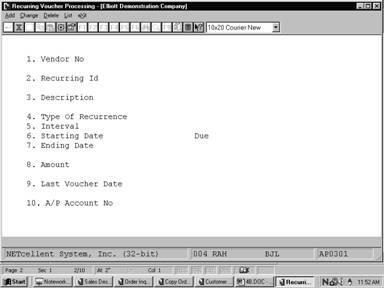 The vendor name and number and the description of the recurring voucher being entered or changed is displayed on this screen automatically. Enter the account to which the expense distribution will be made when the recurring voucher is posted to the A/P Transaction File. The description of the account will be displayed. 9 numeric digits with 2 decimal places and an optional minus sign (9,999,999.99‑). Enter the amount, which is to be distributed to the account. The total of all distribution amounts must be exactly the amount of the recurring voucher. The amount remaining to distribute is displayed at the bottom of the screen and will be automatically updated after each distribution is entered. You will not be allowed to leave this screen until the amount remaining to distribute is zero. Enter the beginning of the vendor number range, which you wish to print on the report. This field defaults to All. This field is not entered if All was selected above. Enter the end of the vendor number range, which you wish to print on the report. This field defaults to the starting vendor number to facili­tate printing the recurring vouchers for a single vendor.